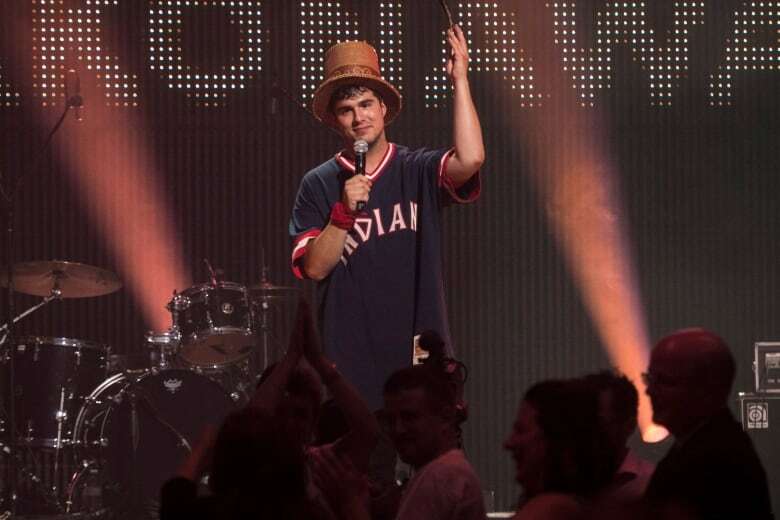 Jeremy Dutcher was inspired to write his Polaris Music Prize-winning album Wolastoqiyik Lintuwakonawa after listening to century-old archival recordings of Wolastoq songs in a language now spoken by fewer than 100 people. Jeremy Dutcher's first words after learning he'd won the Polaris Music Prize were yelled out in his traditional Wolastoq language. "Psiw-te npomawsuwinuwok, kiluwaw yut! All of my people, this is for you!" When Dutcher switched to English, his words were measured, focused and sent a strong message to the crowd packed inside The Carlu Theatre in Toronto on Monday night. "Canada, you are in the midst of an Indigenous renaissance. Are you ready to hear the truths that need to be told? Are you ready to see the things that need to be seen?" Dutcher's debut album, Wolastoqiyik Lintuwakonawa, was selected for the prestigious Polaris prize by an 11-member grand jury of journalists and music industry figures as the Canadian album of the year based on artistic merit. He used his moment in the spotlight to emphatically remind people why he made the album, a fusion of his own operatic interpretations of traditional songs sung entirely in the Wolastoq language. "To do this record in my language and have it witnessed not just by my people, but every nation from coast to coast, up and down Turtle Island — we're at the precipice of something. It feels like it," he said. "I do this work to honour those who have gone before, and I lay the footwork for those who have yet to come. This is all a continuum of Indigenous excellence, and you are here to witness it." "This record is a culmination of five years of work, of research, of community engagement, of recording," Dutcher told CBC's The National in a recent interview. The classically trained operatic tenor and composer from the Tobique First Nation in New Brunswick studied 110-year-old wax cylinder recordings of his ancestors from the Canadian Museum of History, which later became the inspiration for the album. "When I first got to hear these voices, that work for me was a profoundly transformational moment in my life. It was a process of deep listening — to sit there with these headphones and really hear what these voices had to tell me." Dutcher spent weeks inside the museum, meticulously transcribing the recordings once collected by William H. Mechling. The anthropologist lived among Dutcher's ancestors for seven years in the early 1900s, capturing the songs and voices of the community on wax phonograph cylinders. Dutcher says he wanted the album cover to represent that process. "When you look at the album cover you can see wax cylinders on the floor, which were what these recordings were collected on, using the phonograph machine in the middle there. And I'm seated in the chair with this traditional jacket on, I wanted to represent that time that these songs were collected. The cover of Dutcher's debut album Wolastoqiyik Lintuwakonawa depicts the equipment that would have been used to collect the 110-year old recordings that inspired him. The backdrop is Cree artist Kent Monkman’s painting, Teaching The Lost. (Matt Barnes)​Dutcher adds that he was "very, very fortunate to have a music education and to be able to transcribe what I was hearing, and to write it down, and to be able to take that away and create my own music based on these melodies." He adds, "It [the recorded material] is not doing any good sitting on a shelf collecting dust. It has to be with the people." Armed with a notebook filled with transcripts, Dutcher began writing musical arrangements around them, breathing new life into traditional Wolastoq songs. It's a language now fluently spoken by fewer than 100 people, and one his own mother was punished for speaking while growing up. "She went into the church-run day schools at a very young age, when she was six years old. You weren't allowed to speak your language there. In fact, you were physically punished if you did. And the elders knew this, and so they said it's better if we just don't speak to the kids in the language." A photo of Dutcher and his mother is seen in the background as the singer-songwriter performs Mehcinut, one of the pieces from his album Wolastoqiyik Lintuwakonawa. (Sean Brocklehurst/CBC)"So I think the shame that she felt in those schools, that was sort of relayed down from generation to generation. And so that's why I turned to the archive [of recordings]. I think it's important for people to understand a true history of what has actually happened, and what continues to happen in this country, around the systematic devaluing of indigenous languages and cultures." Dutcher says his generation needs to understand the importance of their Indigenous languages. "If the younger generation doesn't start to reclaim and revitalize our language, we're going to lose it forever. When I came into a better understanding of my language, I started to understand my place in the world a little bit better and started to relate the world around me differently. "I think for me, what this project allowed me to do was to sit down with my mother and my elders in my community and ask them about their lives. To say, 'what was your experience of music growing up? What did your community sound like growing up?' And understanding that the circle was never broken. That we're all just part of one continuous artistic lineage of Wolastoq song carriers." After five years of work onWolastoqiyik Lintuwakonawa, Dutcher says he's not finished with the project. The young composer is ready to take it to an entirely different stage. "For me, the journey is not yet complete. There are still so many stories to share. I hear symphonies in 2019, 2020. See you there!" Sean Brocklehurst is a producer with The National and creative and editorial lead of Campus on CBC Radio. Sean has been in the thick of some of the biggest events of our generation — producing award-winning stories, documentaries and CBC News shows covering everything from the 9/11 attacks and Barack Obama's presidential campaign, to the tsunami and nuclear disaster that rocked Japan.